The Creek Company Voyager 2 ready for the first of a few test voyages–this time with a cooler in front instead of a fishing partner. The craft handled Class II rapids easy and was a breeze to row and spin. Doug was in the middle of telling me about an old pool hall “over the yonder hill” where Ms. Heidi let you play all the pool you wanted for $1 while serving chili dogs and cold beer. Doug is the taxi driver who was my shuttle for one particular float. Had I been toting a drift boat or a frame and a raft, I wouldn’t have had the opportunity to get to know Doug, a lifelong friend for sure. 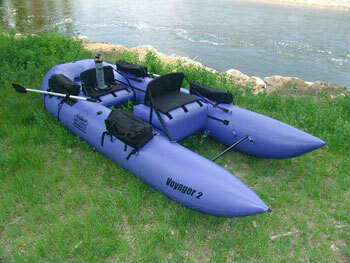 But luckily, I had no trailer, frame, or ungainly craft; I had the Creek Company’s Voyager 2. Creek Company, whose office sits “a fly cast away from the Yampa River” in Steamboat, Colorado, celebrated the 25th anniversary of the company by rolling out the Voyager series. 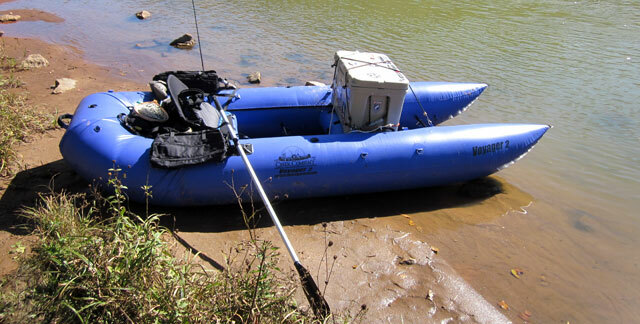 Made up of a one-man pontoon boat and a two-man pontoon boat, the series’ unique attribute is that the rafts are completely frameless. Designed to be lightweight and portable yet durable at the same time, the Voyagers are made of 30-gauge PVC with the two-man coming in at 65 pounds and the one-man at 28 pounds. While the features on the two rafts are largely the same, I will be focusing on those specific to the two-man—the Voyager 2. The pontoon is made up of three separate bladders: a left and right bladder, and a U-shaped back bladder. Both seat platforms are also inflatable. All of the compartments are blown up through push-button valves with a double-action hand pump (with a wide array of adaptors, many of which I did not need to blow up the raft). The raft comes with two seats that have fairly high backs held in place by Velcro and straps that thread through nearby D-rings. The straps adjust so that the seat can be modified to the user’s preference. There is an additional padded platform for the front seat. Four insulated side bags—two for each passenger—strap in beside the seats. There are two foot rests with each user having two options for its placement, one closer to the seat and one further away. The 6.5-foot, 2-piece oars lock into the boat with stainless steel oarlock pins. Lastly, there is a nifty area behind the back seat for storage. I had a few different trips with the raft before writing this review. Two actually were solo trips with a ridiculously heavy cooler in the front seat as my fishing mate. The other trips were with friends who gladly offered feedback in return for the opportunity to take the bow for a few hours. When I first saw the raft, I was concerned with the placement of the oars. With them being that far back in the boat, would it handle well? The boat is Class II rated but would it have the ability to be nimble enough to navigate through Class II rapids? My worries were magnified on the solo trips without a second passenger to distribute the weight better. Fortunately (at least for this occasion) my cooler is way too heavy, and it was made heavier by a few gallons of water. With ice and other goodies in there, it was pretty much the same as having a small child in the front. The cooler fit perfectly in the front seat (without the raised platform)—almost like it was made for it. Well placed D-rings made securing it with four bungee cords very easy. With one person and a cooler, the boat handled very well. It spun great and was very responsive to the slightest strokes. I had no problem handling some Class II rapids and even one Class II+ rapid (don’t tell Mom). Of course I had to either stop or use my primitive chain anchor to fish, but you can’t fault the boat as I doubt they were planning on the rower fishing when designing it. All fishing partners had good things to say about the front seat. The raised platform was absolutely necessary for better clearance. And while a swivel seat or a standing platform would be better, I will trade that for the ability to pack the float down to a bag. The insulated storage bags with cup holders are a nice touch and the oars took a few good beatings and held up perfectly. The platform behind the rear seat was plenty big for the empty boat bag, my chest pack, a gear bag, a jacket and a pretty large camera. Best of all, none of it got wet. The seats are surprisingly comfortable and the pontoons are actually the perfect height for propping up one’s feet during a lazy stretch. 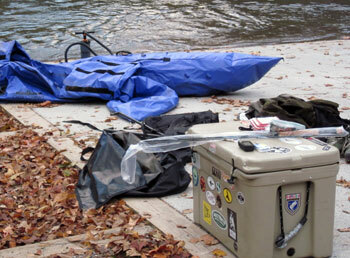 With a padded handle in the back and well placed d-rings in the front, moving the boat with two people is a breeze. In sum, I was very pleased with the raft’s performance. There are a few minor gripes which come mainly as a result of sacrifices that must be made to ensure the portability of the raft. Setup took longer than the company says — it’s important to be organized. During one pretty intense rapid one of the straps that held my foot rest ripped. Granted I was pushing pretty hard to get leverage but I think that should be expected when there is no bottom to the boat. The rod holder system left a little to be desired. From what I can gather the rod holder is a plastic unfinished circle in the back that the rod slides in. I never had the rod fall out so apparently it is secure enough, but another lock or holder in the front of the boat would have made me feel a little better about putting a nice rod in there. Also, the rod can get a little scraped by the oars when in the holder. And although Creek Company claims it takes 5 minutes to be on the water, I found 30 minutes to be a more accurate measure. That being said, it’s not hard, just takes some time to get everything together. The recommended 12-volt pump might be a good investment. Also, I have a hard time believing the raft is only 65 pounds, but I can’t substantiate my suspicions. Lastly, while the number of D-rings is great for securing gear, they sometimes are a fly line attractor. There is a stripping apron for one of the seats, but I never got a chance to use it. Before Doug dropped me off at the put-in he pointed out a place where he and his “Grandpappy” used to fish. Grandpappy was a lousy fishermen but he was good company, according to Doug. I have no idea how Doug’s fishing skills are but I imagine he’s a lot like Grandpappy in the other regard. Maybe next time I’ll take Doug and ditch the cooler.